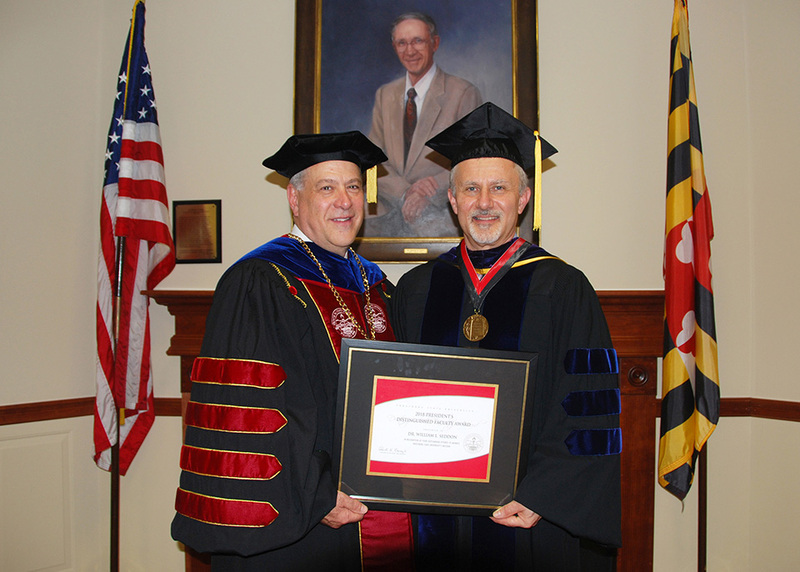 Dr. William Seddon, a professor in Frostburg State University’s Department of Biology, has been selected as the sixth recipient of the President’s Distinguished Faculty Award, which was presented during FSU’s 152nd Commencement Ceremony. The award recognizes a faculty member who has provided exceptional service to the University and has advanced its mission, goals and strategic planning initiatives. Seddon is being recognized, in particular, for his passion for community and educational outreach that has brought more than 2,000 regional students – ages 6 to 16 – to the FSU campus for a multitude of STEM enrichment activities. As STEM Outreach coordinator, Seddon coordinates these visits, which includes enlisting faculty and staff to pitch in for the events. He also participates, often explaining to students how the Compton Science Center’s Foucault pendulum demonstrates the rotation of the Earth or operating controls in the Multimedia Learning Center. He has also taken the leadership of Compton’s Natural History Museum, helping it serve its initial community outreach purpose by making the museum of taxidermy specimens from around the world available during open houses and Science Saturdays. He has worked with students from FSU’s College of Education and other areas in developing new and engaging activities for this resource.